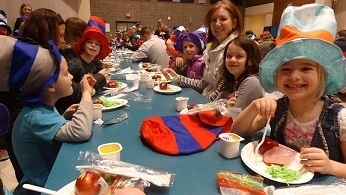 South Ridge Elementary and Union Ridge Elementary School first graders and their parents celebrated Dr. Seuss’ birthday this past week with a Green Eggs and Ham breakfast sponsored by Beaches Restaurant. The celebration is part of the nationwide “Read Across America” program that takes place annually on Dr. Seuss’s birthday, March 2, to encourage reading in the schools. 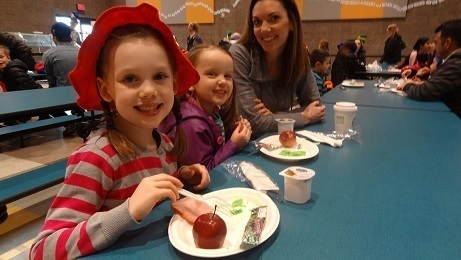 Not only did students and parents enjoy a reading of Dr. Seuss’ book “Green Eggs and Ham”, they were treated to a delicious green eggs and ham breakfast served by Beaches Restaurant volunteers and by Ridgefield Mayor Ron Onslow and Ridgefield City Councilor Don Stose. In addition, each student received a free Dr. Seuss hat, and Beaches Restaurant provided door prizes. We are grateful to Beaches Restaurant, which has been sponsoring the popular gathering each year since 1996 to encourage parents to get involved in reading with their kids. Currently, 48 schools county-wide participate in the much-anticipated event.